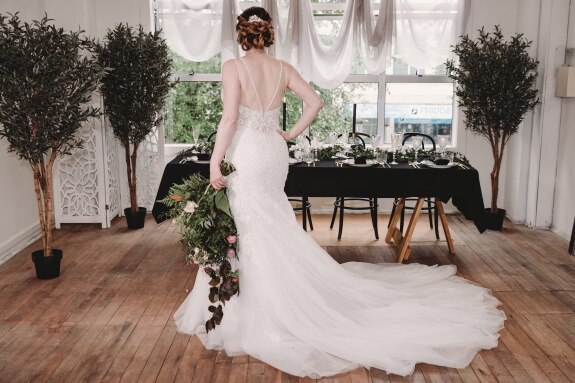 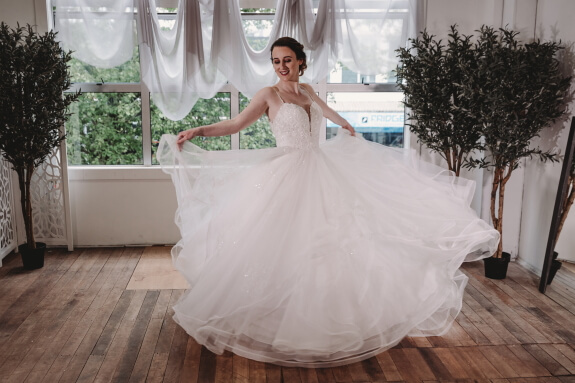 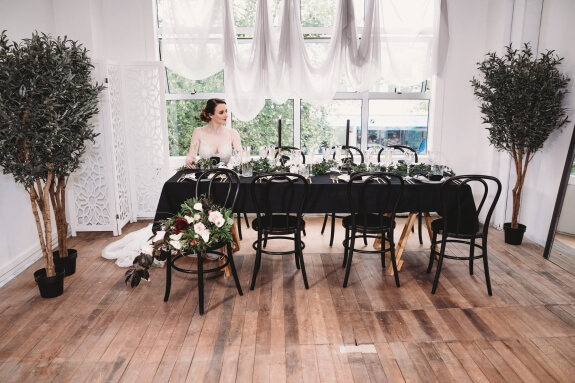 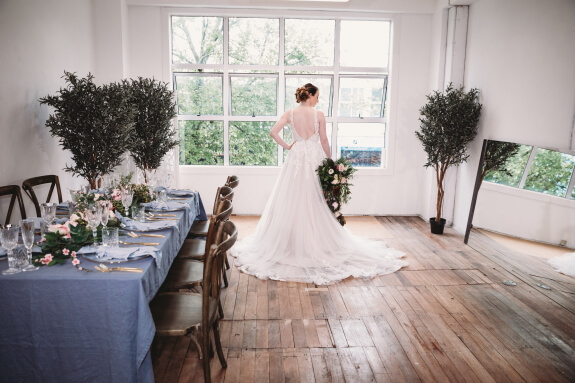 In an unassuming and bare loft space amongst the New Plymouth CBD tree tops – a group of Taranaki Wedding Vendors came together to create a little bit of magic. 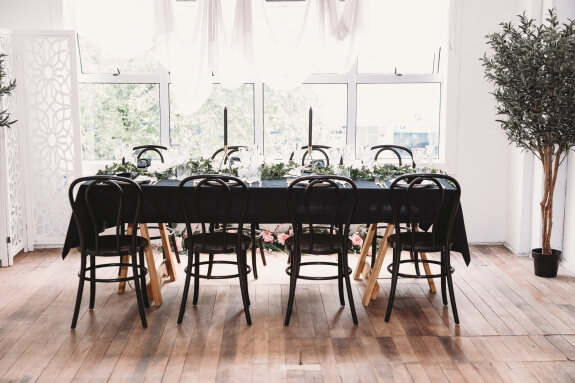 With it’s unfinished raw wooden floors and white washed concrete walls “The Loft” provided the perfect blank canvas for this team to showcase two completely separate styles. 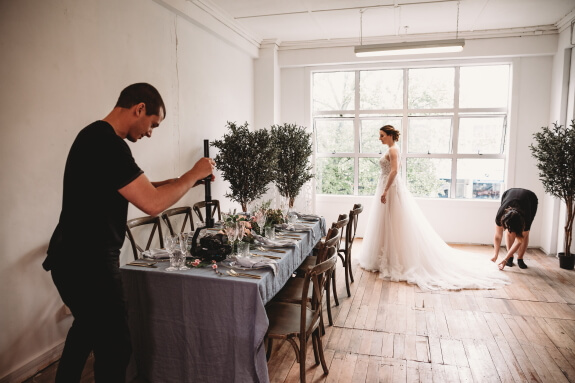 This collaboration shoot goes to show that a little imagination goes a long way to creating an intriguing and stunning look when presented with a blank canvas. 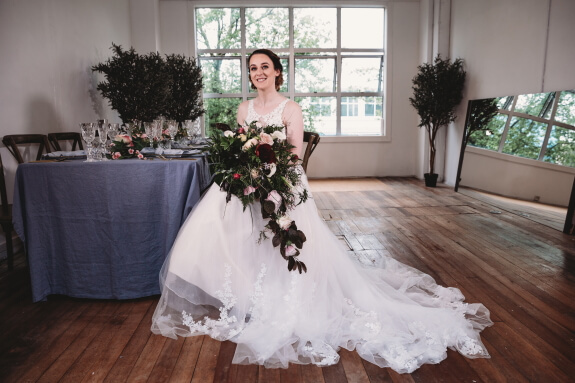 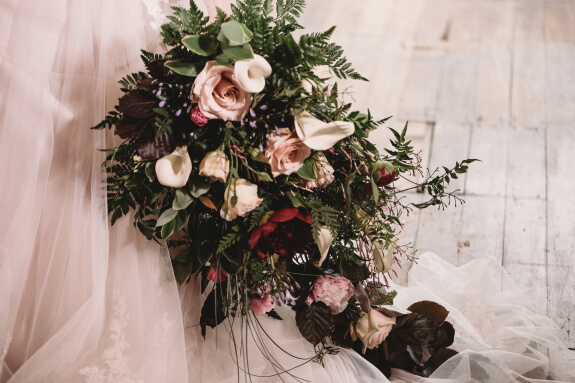 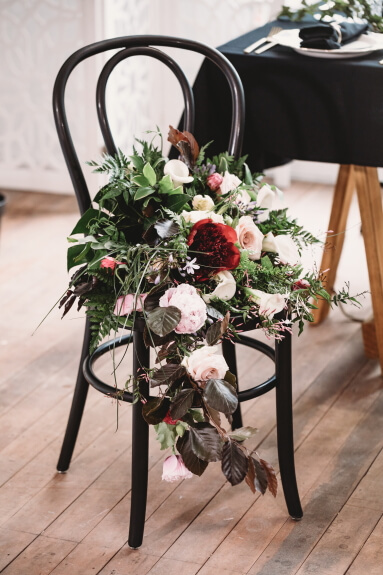 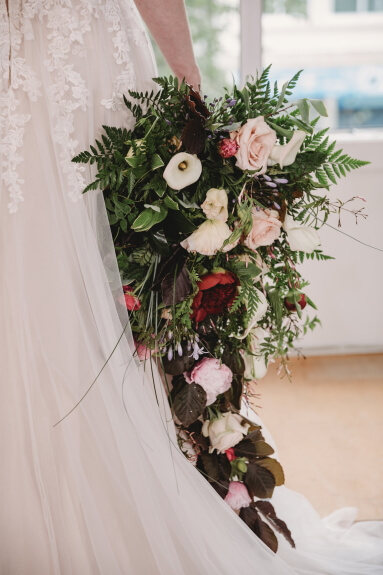 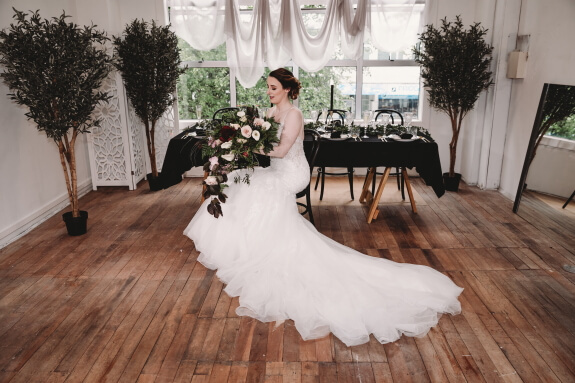 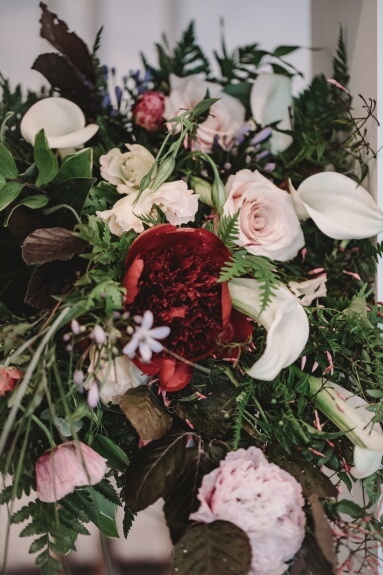 Drawing inspirations from the lush green treetops outside Steph from Ivy Lane Florist created an incredible cascading statement bouquet of deep rich red, soft blush pink and an abundance of lush greenery – bringing the outside in. 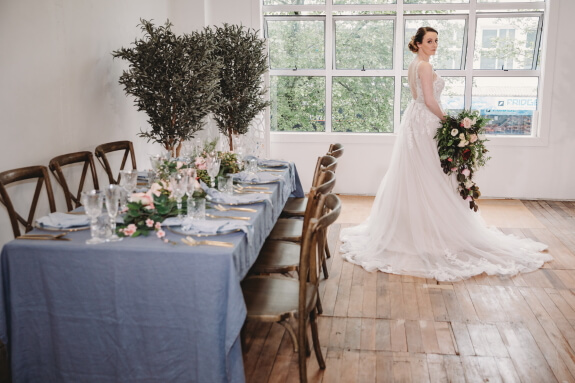 Jenny from Dobsons Marquee and Party Hire styled the table and room – creating two separate looks with their own individual styles. 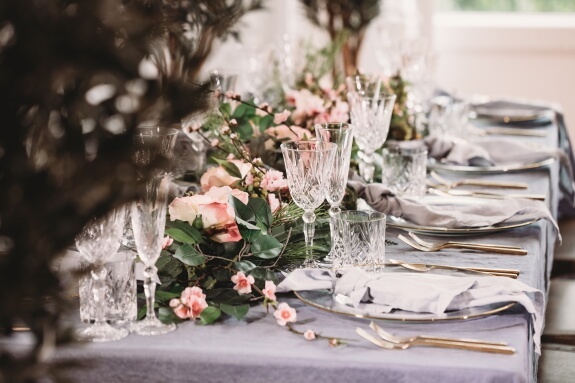 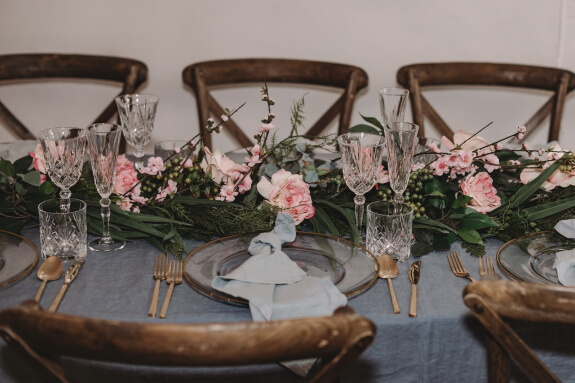 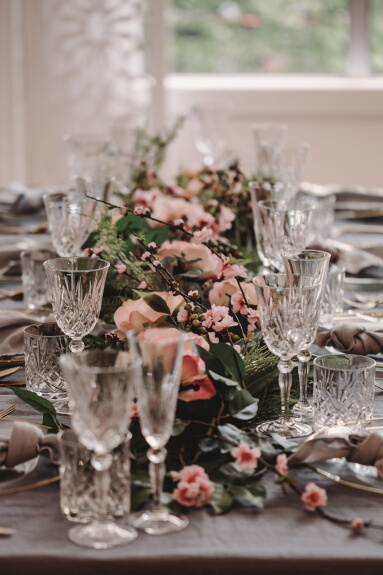 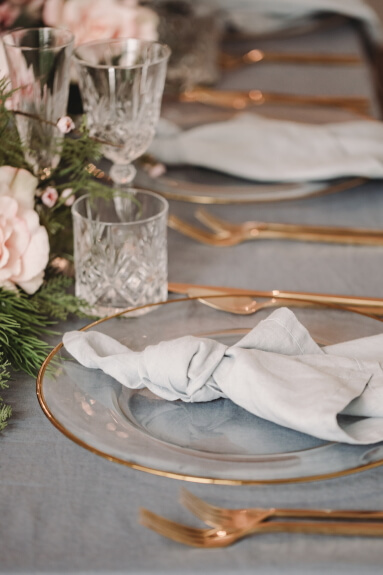 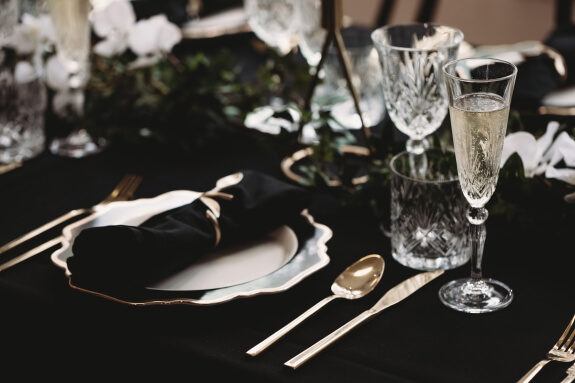 While each setting both incorporate certain items – they are teamed with different colour pallets, textures and finishing touches to create one look that is feminine and romantic while the other is glamorous and opulent. 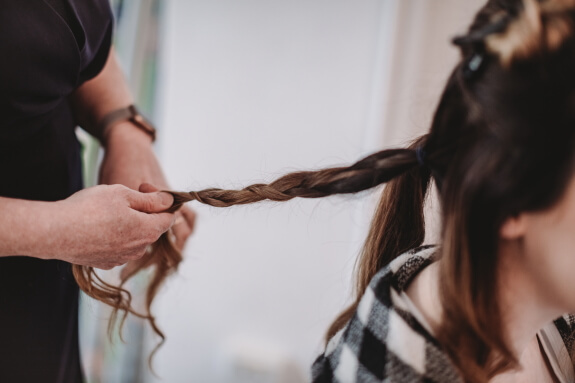 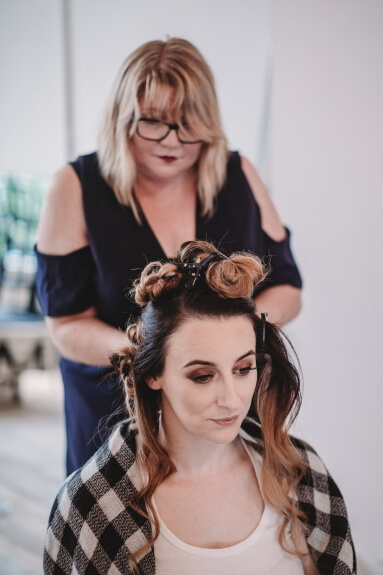 TW boss lady Louise loves ANY excuse to get frocked up and the talented Pretty by Danielle and Hair by Kate worked their own special kind of magic creating a Bridal Model out of a frazzled boss lady! 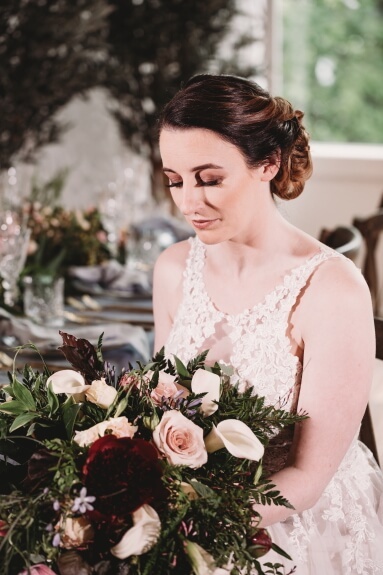 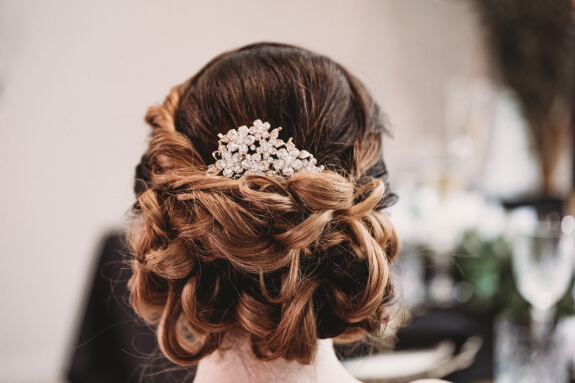 Danielle created a classical Bridal look with subtle contouring and a feature bronze toned eye with luxurious long lashes while Kate created a versatile and romantic hairstyle to suit the necklines and styles of both gowns used. 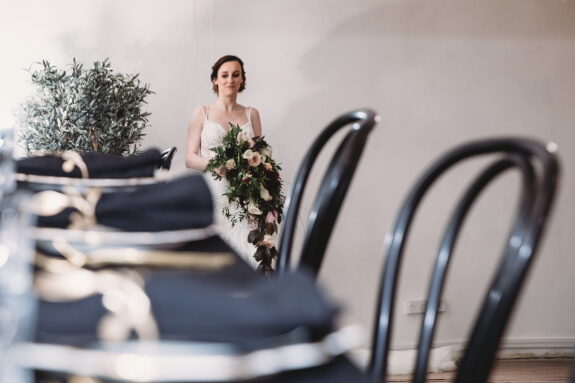 Gown and accessories were carefully selected by the consultants at Churchwood Bridal to perfectly match with Dobsons Marquee and Party Hire’s styling. 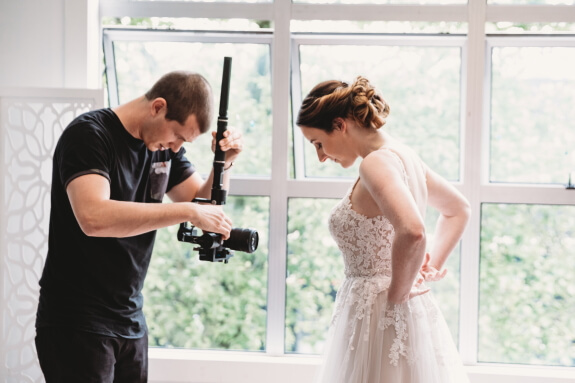 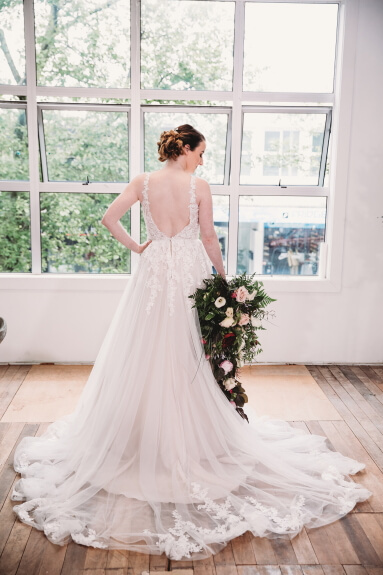 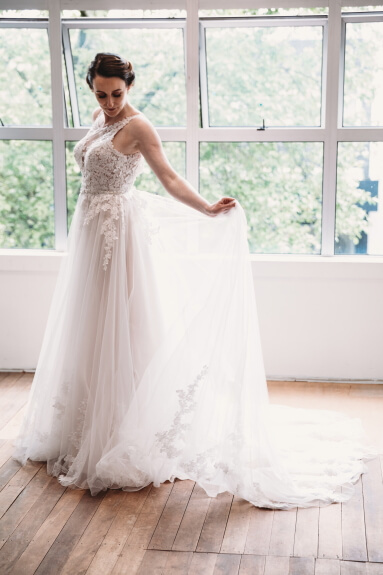 A photoshoot wouldn’t be a photoshoot without an amazing photographer to capture every little detail – Amanda Ritchie Photography created some beautiful images and the fantastic Andrea from Likuid Media Wedding Films was there to capture the fun! 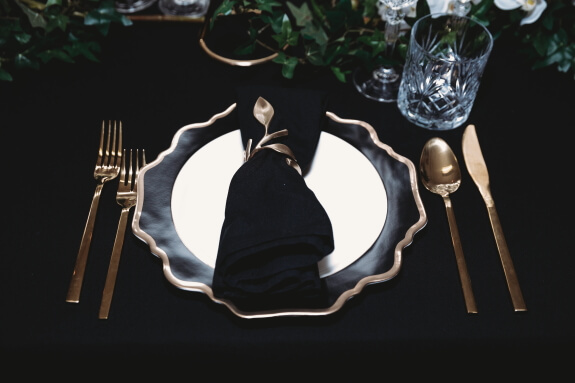 Feast your eyes on the images below and check out the incredible video.